The main source used by the project are coroners’ reports preserved among the records of the Court of Kings Bench (KB), one of the two principal common law courts along with the Common Pleas, at The National Archives (TNA). An estimated 9,000 such reports from all over England survive for the sixteenth century in 371 files in TNA classes KB8 and KB9. The National Archives, Kew. Click to go to TNA website. The reports, or inquisitions (from Latin inquisitio, “inquiry” or “investigation”), are written records of inquests held by coroners to determine the exact cause and circumstances of violent or unnatural death. They were drawn up by coroners following a viewing of the dead body, and after a consultation with and in the presence of a jury consisting of between ten and 24 local men of good repute convened to assist the coroner. In addition to the verdict, or a conclusion as to the manner of death, the inquisitions give the name of the victim, the date, location and nature of the accident and the date and cause of death. Many provide other details such as the victim’s age, occupation, and place of residence, the time of day, the names of family members, and names and occupations of other people present. If it was found that death was caused by an animal or an inanimate object, they were considered a deodand (from Latin deo dandum, “to be given to God”) subject to forfeiture to the crown. The coroner and jurors appraised and recorded deodands’ value, and named a person, who was charged with safekeeping seized items until the owner paid a fee or until a local magistrate collected the deodand on behalf of the king. 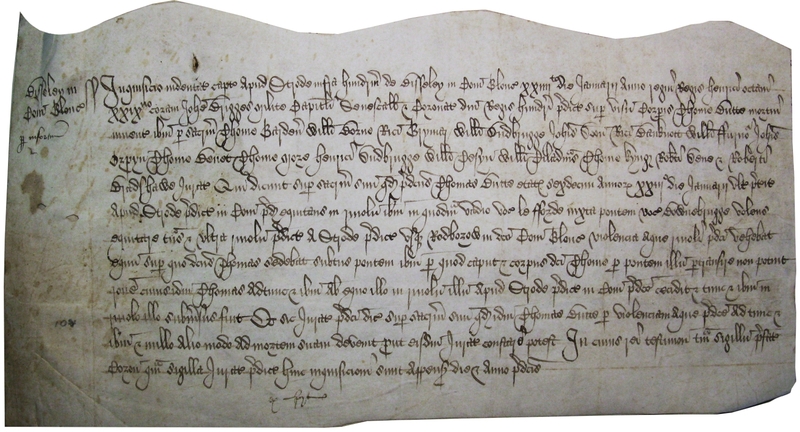 A Gloucestershire inquisition filed in 1538. Click to enlarge. The reports vary in length and the amount of detail provided but the majority do not exceed 300 words. They are written in Latin in cursive hand on rectangular strips of parchment or paper usually not larger than A4. After one copy was signed by the coroner and the other one by the jurors, the document was cut in two by an indented line. The statutes of 1487 and 1510 (3 Henry VII, c 2 and 1 Henry VIII, c 7) required coroners to produce all their records of inquests regularly at gaol deliveries, normally held twice yearly. The gaol delivery justices, and later assize judges, would then forward them to KB. Inquests delivered in Lent were normally forwarded to KB in Easter term and those delivered to the summer assizes appear in Michaelmas term files. 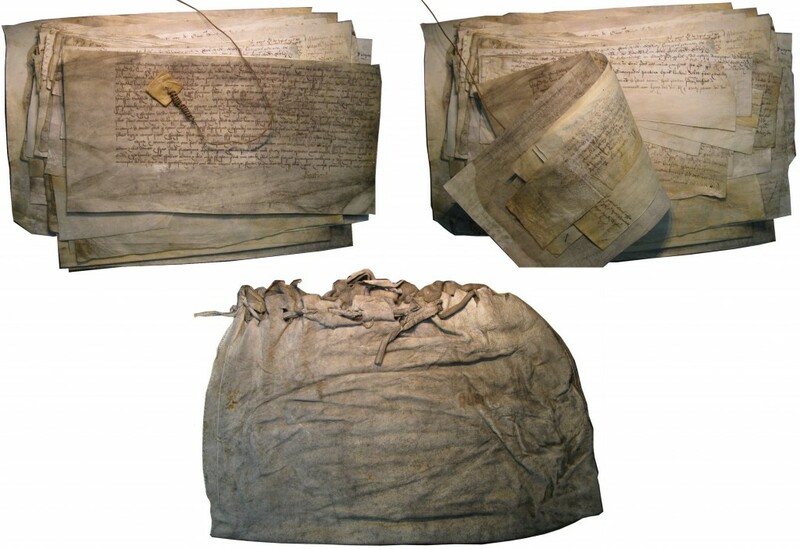 Originally, all inquisitions – along with other types of KB documents – were kept in stacks, bundles or rolls bound together with sinew or leather thongs and held in leather or linen burses. Since the mid-nineteenth century archivists and historians have been sorting and cataloguing KB material to organize and study it and to make it accessible to researchers. The majority of coroners’ reports used by the project are now sewn together with other KB records, arranged into files stored in large paperboard folders. There are usually four files per year, one for each judicial term – Hilary, Easter, Trinity and Michaelmas. The reports can be browsed and studied with relative ease. A small proportion have been damaged or the writing has faded so some information they contained is irretrievably lost. A KB9 file with a burse. Click to enlarge.